This beautiful A. Lange & Söhne Tourbograph 702.025 luxury watch represents the class and style of every proud owner in a unique way. You are looking for another Watch? The A. Lange & Söhne Tourbograph 702.025 luxury watch is an authentic watch of enchanting watchmaking art. The face has and the lunette is . The movement is Tourbillon. To perfect this unmistakable luxury watch, the bracelet sets a perfect accentuation of the case with . The functions of this luxury watch include . The watch has the product status New and is instock. If you order this copy, the watch is delivered with Original Box and with Original Papers. Of course, all our new watches come with the corresponding manufacturer warranty. 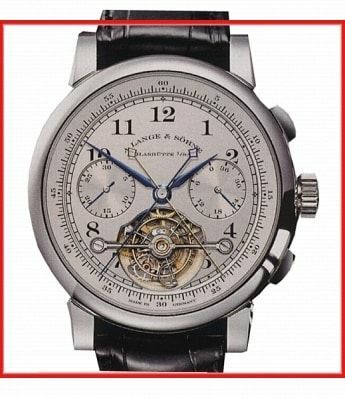 Take a closer look at our A. Lange & Söhne luxury watch. You will quickly see why it is one of the bestsellers in our extensive range of luxury watches. Discover the world of A. Lange & Söhne watches and learn more about A. Lange & Söhne on the Manufaktur Webseite. Take a look at our other exclusive luxury watches and see why A. Lange & Söhne and other watch brands are so seductive. Rattapante is a leader in the online luxury watch market. From new, unused to used watches, we offer only the highest quality watches, including the A. Lange & Söhne Tourbograph 702.025. Let one of our enthusiastic watch consultants help you to find the right luxury watch for your lifestyle. We will gladly take care of all the details during the purchase process and offer you first-class conditions at all times. You are not yet sure which luxury watch should be the next in your collection?No problem! Browse our watch catalogue and be sure to check out the detailed information on our Top Brands such as Breitling, Hublot, IWC, Omega, Officine Panerai, Tag Heuer and Zenith. Our detailed brand overview pages provide a wide range of information about the brands and their history.Of course, the most important series and models of the various selected brands are also featured. Use the request function and state your questions or wishes in the designed field. We are happy to answer your questions or special requests and make you a suitable offer.